These days, technological advancements isn’t merely about creating faster and more efficient machines. 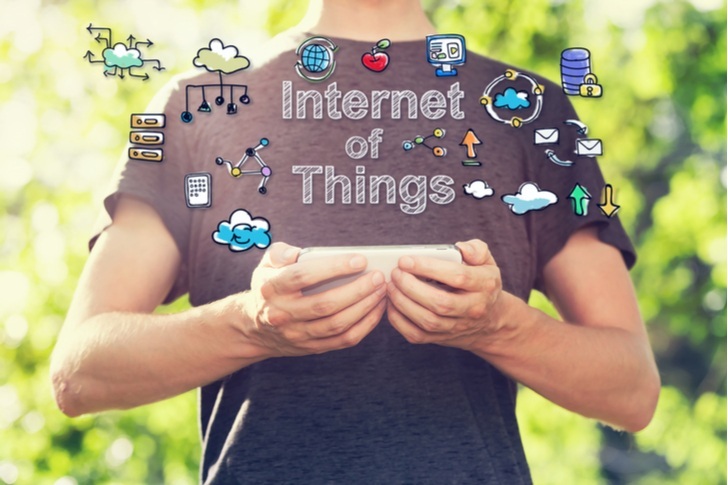 Instead, tech firms heavily emphasize connectivity, which represents the core basis of the “internet of things.” Considering the trend toward IoT, you’ll want to consider internet of things stocks sooner rather than later. Imagine having a smart thermostat in your home. It not only tells you the temperature, it can log-on to the internet, and extract this week’s weather forecast. The smart thermostat can then send signals to your connected cooling and heating system, and request adjustments accordingly. It sounds like science-fiction, but this scenario is very quickly becoming science-fact. Simply put, the IoT progression will never cease. As a result, buying internet of things stocks is an exceptionally smart strategy. Primarily, analysts covering this sector suggest tech and semiconductor firms whose innovations positively impact IoT trends. But also, don’t forget companies that retail interconnected devices. Nowadays, we take the concept of wearable devices for granted. Whether we’re tracking calories burned through our fitness trackers, or answering emails on our watch, we do IoT subconsciously. However, each IoT device requires substantial engineering and innovations. That’s where Cypress Semiconductor Corporation (NASDAQ:CY) comes into play. A smartwatch or fitness tracker utilizes several sensors and computer chips. Principally, of course, these devices must feature WiFi and Bluetooth computability; otherwise, the IoT label is pointless. In addition, they require a GPS system, a digital interface screen, and especially for fitness trackers, gyroscopes and heart-rate monitors. CY is a premium manufacturer of these highly-specialized semiconductors, which is why companies like Garmin Ltd. (NASDAQ:GRMN), Nintendo Ltd/ADR (OTCMKTS:NTDOY) and Sony Corp (ADR) (NYSE:SNE) employ its services. Although CY has been one of the more choppier internet of things stocks this year, it’s still performing very well. Year-to-date, shares have gained over 14%. That said, I’m not so concerned about the nearer-term movements. As IoT integration is a virtual certainty, I look at CY is an ultra-long term investment. The IoT movement has been so transformative that you’d have to be a dedicated Luddite not to care. Since machines occupy your residence rent-free, it’s about time they did something useful other than their stated purpose. But with interconnectivity comes huge risks, which is something that internet-security firm Cyberark Software Ltd (NASDAQ:CYBR) addresses. I’ll answer that question by saying that IoT innovation is dangerous without proper controls and safeguards. CYBR is one of the leading internet security and risk-management firms in the world, and its services is becoming increasingly relevant as more devices reach ubiquitous connectivity. As an added bonus, it’s one of this year’s most convincingly stable and bullish investments. CYBR stock is up 60% YTD, and further gains are likely. Whenever analysts discuss internet of things stocks, you’ll typically find recommendations for tech companies. Naturally, IoT can’t exist without the tech sector, so this focus is completely understandable. That said, we shouldn’t forget one of its main purposes: making people’s lives easier. Stated another way, IoT means nothing if consumers have zero interest towards interconnected devices. Therefore, Best Buy Co Inc (NYSE:BBY) is one of the best indirect plays among internet of things stocks. As any technical chart can tell you, BBY stock is a remarkable recovery story. Hitting peak market value prior to the 2008 financial crisis, the Great Recession hit brick-and-mortar retailers hard. Even as the broader consumer economy recovered, several retail businesses had to make painful cuts. Although BBY wasn’t an exception in this regard, it also adapted to economic pressures intelligently. Last year, I featured their management team’s push into senior services. For a small, monthly subscription, the company “offers comprehensive senior monitoring.” That’s just one example. As manufacturers increasingly focus on IoT devices, Best Buy will certainly carry them. And while I’m cognizant of Amazon.com, Inc.’s (NASDAQ:AMZN) competitive threat, I think the two firms can co-exist. You often can’t beat Amazon’s prices and conveniences. That said, nothing beats being able to visually examine your target product and bringing it home that very day. And with its tech-centric business, BBY is easily one of the best internet things stocks to buy! As of this writing, Josh Enomoto is long SNE stock. Louis Navellier — the investor the New York Times called an “icon” — just helped investors make 487% in the booming Chinese stock market … 408% in the medical device sector … 150% in Netflix … all in less than 2 years! Now, Louis is urging investors to get in on what may be the opportunity of a lifetime. By using a unique investment strategy called “The Master Key,” you could make hundreds of percent returns over the next few years. Click here to learn about the #1 stock recommendation from one of America’s top investors. Article printed from InvestorPlace Media, https://investorplace.com/2018/06/3-indirect-internet-of-things-stocks-to-play-the-growing-iot-space/.